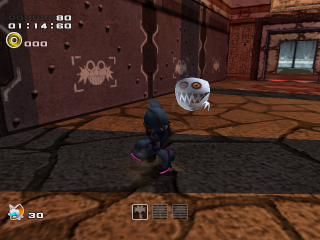 Boo (ブー Bū) is a ghost that appears in several haunted stages of Sonic Adventure 2. They come in two types: a normal one and an attack one. The former resembles a smaller version of Boom Boo. It only has one attack, which is to scare a character momentarily (in which they look like the attack type). They are found standing still, iddling around or patrolling an area. After scaring a character it disappears, but awards no points. The latter is bigger, with large and colourful eyes and mouth. It has two attacks: holding a character in place, running into the character, this one taking damage. It sometimes stands still in the middle of the air only to swoop down and quickly chase (sometimes jumping as well) a character that comes near or mills around slowly, only to chase the character quickly once it sees him or her. After being hit it disappears and awards 100 points. It should be noted that throwing objects doesn't affect ghosts. Boos appeared in one episode of Sonic X, The Ghost of King Boom Boo in the Old Castle. Boos return in the Wii U/PC version of Sonic Lost World, appearing only in Sky Road Zone 4. Unlike the versions from Sonic Adventure 2, Boos are indestructible obstacles that move left or right crossing the screen in groups and causing damage if touched. Boos reappeared in Sonic Runners as a rare Power Type buddy which boosts score if the player destroyed super enemies and turns common enemies into super enemies. During the Halloween event, the Boos were brainwashed by Dr. Eggman, who fed them with special candy. However, one of the Boos allied with Rouge and E-123 Omega to stop Eggman. When Team Sonic joined the mission, the Boo helped them find the scientist's hiding place. In the showdown with Eggman and the enslaved King Boom Boo, the Boo then brought Omega a searchlight in accordance to Rouge's orders, which Omega used to restore King Boom Boo to normal.